Spatial data has some formats most of you know (shapefile, geoJSON, TiFF,…). But there is always a wide variety not only in available and used file formats but also in structure of data and formats of the data itself (numbers as text, different separators, etc.). To manage this variety and support the work with a standardized data set most companies use so-called ETL tools to Extract, Transform and Load data. 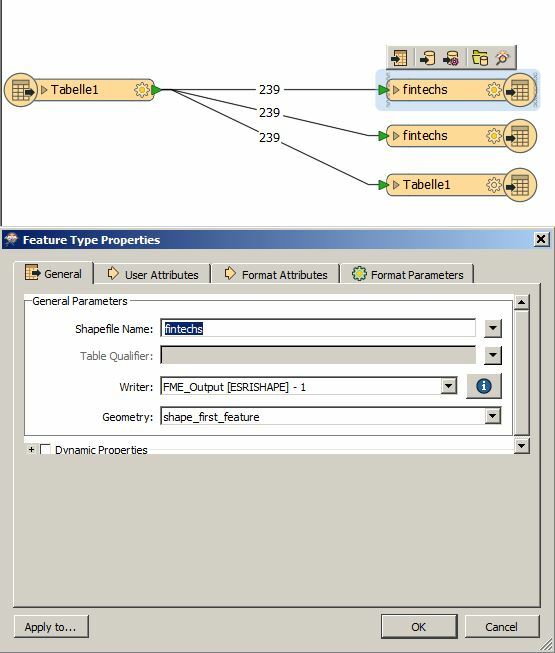 In this article I would like to present you two of them: FME from Safe Software and Talend with Spatial Extension. So check my little examples. FME is a product from Safe Software and is somehow the flagship when it comes to ETL processes, data manipulation and process monitoring. The installation is a no-brainer but this does definitely not come for free. An indicator for the price is set at the cloud provider. Despite this price: If you need software like FME for your studies, just drop them a line as they have an academic grant program. For short-term tests they offer a 30 day trial. The software itself can be used in three-way: Desktop version, Server version or Cloud version. You’ll get support for over 350 file formats. The first task was done quite easy as you simply load the excel with a file reader process and attach three different file writers to it. As you simply need to define the lat/lon columns everything else is done by the program. Take care of string formatting a bit and decide which columns you really need and off you go. One read process, three writers. clean and simple. The help section of this software is really great and you will find plenty of video tutorials for this baby made by FME. I like the clean interface and the supporting docs quite a lot and the Data Inspector will support your daily work a lot. Off course I was not able to explore the whole power of FME but I think it is a powerful tool. I will definitely play around with it for a while. Talend is a java based platform independent data quality and integration tool. It is somehow “open source”. 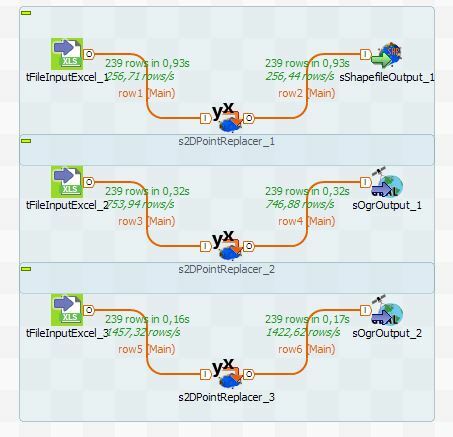 I was using talend’s Data Integration Tool to work on my problems. As this is a Java application make sure you have a proper JDK installation. Then there is no installation of talend at all as it runs in this Java sandbox… The core of talend is not designed to work with spatial data. But there is this nice github page for a spatial extension. Together with the forum it is a good starting point. As it is done it FME I also need to define each column in terms of the format but to define the geometry I needed to embed this process s2DPointReplacer. Not very intuitive compared to FME but maybe it’s the burden of the multi-purpose tool. 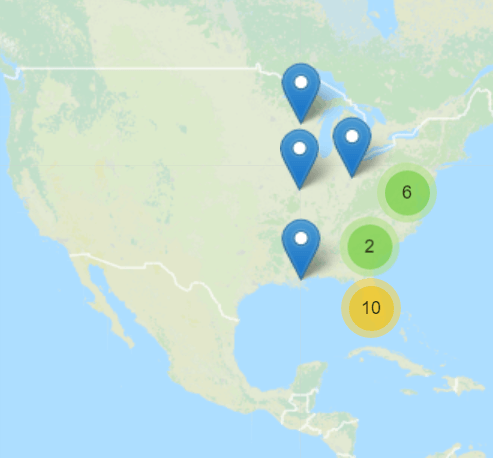 The other process of using a google spreadsheet for upload to a server as geoJSON was easier compared to FME in terms of running a FTP task but I was too lazy to figure out how to connect with GDRIVE, get the file and so on. I simply made a filefetch of the published google spreadsheet, stored it locally, made the decimal separator replacement and the geometry extraction. The whole process was finished after 3-4 seconds. So it was a bit faster than FME ;-). I like the multipurpose approach of the tool but the program was a bit buggy (changing language to only English made it crash) and a bit slow from the interface. Nevertheless it is a good alternative if you need to take care of multiple also non spatial ETL tasks. 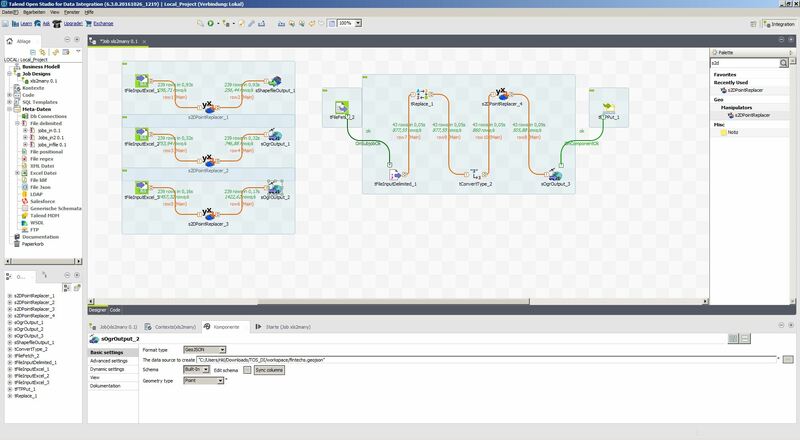 For script automation: There is a great article in the talend help center. There is also a list/comparison/test on stackexchange, a list of open source ETL tools. And of course the model builder in ArcGIS and QGIS are quite good alternatives to some external programs.